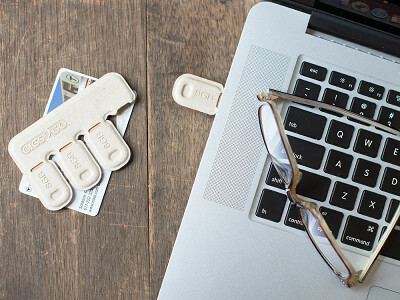 Gigs 2 Go is a credit-card sized pack of four detachable thumb drives that make it easy to share large files with family, friends, and clients. Just tear one off and plug it in. FoldIT is as thin as a credit card, making it another practical flash drive solution. No more worries about losing or leaving behind pricey USB flash drives. Created by product designer Kurt Rampton, the thumb drives are housed in recycled paper pulp and recycled plastic. In fact, the first prototypes were concocted in a kitchen blender, where Kurt pulverized paper and water together to mold the packaging. Perforated for easy release, these little drives hold big caches of music, movies, and power point presentations. Each tab can be labeled with a Sharpie and has a COB (chip on board) flash stick, which is much more rugged than traditional USB memory. Waterproof and shockproof, they don't even need a cap for protection. In 8 and 16 GB sizes, CustomUSB offers inexpensive flash drives and a fast way to take your files with you anytime, anywhere. Hi, I'm Kurt, and I'm happy to share our tear-away USB hub. It's great for sharing files on the go. Let me know if you have questions. Thanks! This idea is neat, but these are easily twice the price of typical thumb drives. @Brad Thanks for the feedback! These drives are enclosed in post-consumer molded paper pulp. This material has lots of benefits over plastic (renewable, biodegradable, easy to write on) but it's also a slower manufacturing process, so it is slightly more expensive. Add to that the convenience of having a handy four-pack with tear-off drives, and we think it's worth it! I have to agree...the concept is brilliant....but I have a dozen USB drives in my briefcase that I can give away cheaper.... I can make printed promotional ones for less than that. Is the size of each of each flash drive 8 or 16 GB? Or is the total of all 4 drives on the tear-away 8 (2 GB each) or 16 GB (4 GB each)? Amy from The Grommet team here. Good question. You'll see in the details portion which you can find when you click into the box that says "buy" that you have the option to purchase a pack with 32 GB total (8 GB in each) or 64 GB total (16 GB in each). Can you put material on all 4 drives at once? Like if you were using this to provide educational material at a conference. Can I send these flash drives through snail mail in an envelope without damage? They are very durable, however it's hard to know how often the envelope will get thrown around once in the mail. We would suggest wrapping them in some bubble wrap just to be on the safe side. Great idea, but why not make a reusable version? The wallet size idea is great, but you could have different data on each and pull out and use as needed, then reinsert back into a holder that would fit in the wallet. The paper holder would be useless after a couple of uses. It would also be great to have a commercial version of these where as "Leah" stated where all could be preloaded before being detached. Love the concept. @Jack thanks, that's a great idea! We have been kicking around ideas like yours, where the "holder" allows you to preload all four drives at once. This would add a good bit of cost, but we are definitely going to explore it in the future. Thanks again! I'm thinking of using these for promotional items. Is text engraving possible and is there separate pricing for volume purchases? We aren't offering volume purchases or engraving on our site at the moment but it's good to know this is something you're interested in. Kurt will be very appreciative. I like the idea but your lead in claims it is less expensive and you don't have to worry about losing the high priced thumb dives- yours is way more pricey than the ones I can buy and while yours appear to be convenient, I've got some pretty tiny ones that cost less that I wouldn't mind losing. I know this price might not work with some of our supporters and Kurt did a good job addressing this above. You can scan above, but he explains that these drives are enclosed in post-consumer molded paper pulp. This material has lots of benefits over plastic (renewable, biodegradable, easy to write on) but it's also a slower manufacturing process, so it is slightly more expensive. Add to that the convenience of having a handy four-pack with tear-off drives and Kurt and his team feel it's worth it. 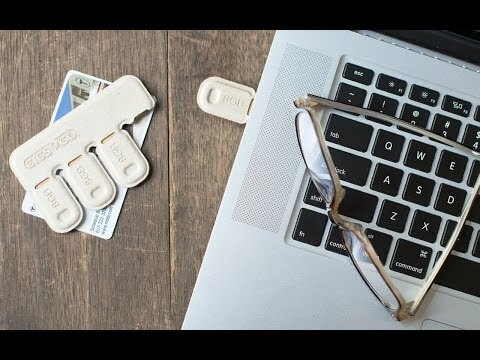 Gigs 2 Go is a credit-card sized pack of four detachable thumb drives that make it easy to share large files with family, friends, and clients. Just tear one off and plug it in. FoldIT is as thin as a credit card, making it another practical flash drive solution. No more worries about losing or leaving behind pricey USB flash drives. 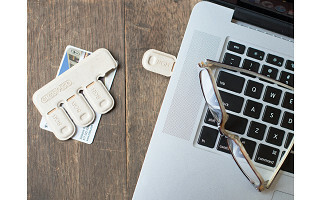 Created by product designer Kurt Rampton, the thumb drives are housed in recycled paper pulp and recycled plastic. In fact, the first prototypes were concocted in a kitchen blender, where Kurt pulverized paper and water together to mold the packaging. Perforated for easy release, these little drives hold big caches of music, movies, and power point presentations. Each tab can be labeled with a Sharpie and has a COB (chip on board) flash stick, which is much more rugged than traditional USB memory. Waterproof and shockproof, they don't even need a cap for protection.